EAO Ltd has introduced a new family of DC centrifugal fans that in typical high performance cooling applications consume 13% less power than competitive products currently available and offer significantly reduced acoustic noise levels. Manufactured by Sanyo Denki the new San Ace C175 9TGA DC centrifugal cooling fans measures just 175mm x 69mm. The 48VDC version delivers 1100Pa (max) static pressure with a maximum airflow of 1056m3/hour (622 CFM) whilst the 24VDC version produces 830Pa (max) static pressure and delivers a maximum airflow of 918m3/hour (541CFM). Both fans features a sound pressure level (SPL) rating that is 3dB(A) lower than competitors’ products. The new San Ace C175 9TGA cooling fans are part of an extensive Sanyo Denki centrifugal fan range supplied and supported by EAO Ltd. 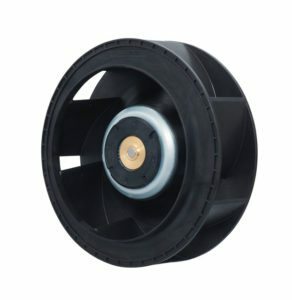 The company’s product portfolio also includes DC centrifugal fans in100, 133, 150, 175, 221, 225 and 270mm diameters, available in both standard and IP55 rated versions.